Shogun of Time Online Slot Review – 243 ways to win! Shogun of time is powered by Microgaming and created by independent game-makers, Just for The Win. The slot’s theme combines ancient Japan with a futuristic, cyberpunk world. Set in a teleporting station, neon-styled symbols include low-value A, K, Q, J and 10 royals, as well as high-value coins, fans, warrior chest plates, face masks and helmets. Keep an eye out for the Shogun of Time logo, as 5 across a full payline will give you 12x your bet. The Cyberpunk girl is the wild and equals the same value as the top symbol. It also performs all the usual substitution duties (except for the pink cherry blossoms free spins / scatter symbols) to help you form winning combinations. When you land a four-of-a-kind winning combination during the base game, it sets off the Reel Split Re-spin feature. All reels then become locked in, and a 5th reel is added to the centre of the reel set, which then re-spins to hopefully give you even more wins. You will also notice that during this feature the paylines increase to 243 ways from 81. This feature is the slot’s main attraction, and kicks off when you land 3 or 4 scatter symbols, for which you will receive 8 or 16 free spins respectively. All 5 reels are in play here, and you will benefit from a pay-both-ways reel set and 243 ways-to-win. During this round the middles reel also becomes a fully stacked wilds, which will remain locked in place for the duration of the feature. 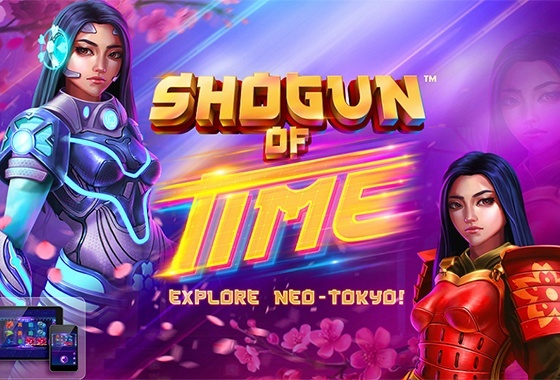 Despite its odd design, Shogun of Time is a simple slot that, if you’re lucky, can pay out over 2717x your total stake during the free spins feature. JFTW tried something bold with the deduction of the 5th reel, and honestly, we’re not entirely impressed by it.